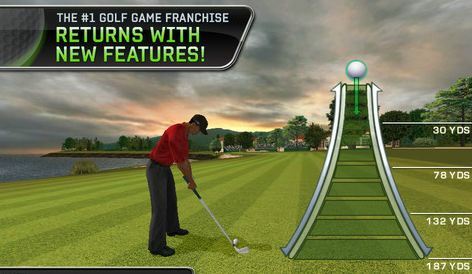 Tiger Woods PGA Tour 12 is an exclusive title for Xperia Play, at least where Android is concerned, as it won’t be released for other Android devices until some unknown point in the future, much like Dead Space and the forthcoming FIFA 12. This shows that EA has a lot of faith in the fledgling ‘PlayStation Certified’ platform, and it is great news for Xperia Play owners who like a spot of golf, as Tiger Woods 12 is a fantastic take on the sport for mobile. The great thing about this game is the fact that although this is essentially a version of the iOS game recently released, this title actually feels more like the big console versions. This is because of the swing mechanism, which uses the circle pad to great effect. You pull back on the right hand circle pad to draw back your club to the required level, then swipe up quickly to strike the ball, and you can add draw and fade by altering your swing as you would expect. This is a great system, and feels completely natural. Wit the touch screen only editions, you get an onscreen prompt to do much the same thing, but somehow using this method just feels better. Maybe its the physical feedback you get from the pad, or the fact that your finger isn’t covering up the screen, but personally I think it’s a mixture of both, added to the fact that this way seems much more relaxed and precise. When you pull back, you can swipe up immediately for a standard shot or wait a moment for the indicator to turn red to attempt a power boosted shot, although if you wait too long you will lose all your power. The game is pretty difficult, even on the ‘easy’ setting, and requires you to be very precise with all of your shots, chips and putting. The rough and sand traps are particularly devastating, but I feel that all of this makes for a better game, and you know you have made a bad shot from the instant you swipe up is the wrong direction. The ability to add spin to the ball when it is in the air can help to alleviate mistakes slightly, as well as help you get a perfect shot when you play well. Functions such as zooming into the green etc are all handled well by the Xperia Play’s buttons, and overall, you will be very pleased with the relaxed nature of the controls. There are 8 real world courses to play on, and they all look gorgeous, with gorgeous weather and time of day effects. Pebble Beach in particular, looks stunning. There are plenty of game modes to get your teeth into, from the standard match and stroke play, to the full PGA Tour and the fantastic Tiger’s Challenge. This mode feels a lot like the World Tour mode from Virtua Tennis, and see’s you performing small tasks that earn you money and get ever more difficult. There is a two to four player option for several modes, although this is limited to pass and play; there is no local or online play to be found. Another strange omission is the Closest to the Pin Facebook challenge mode, a favourite on iOS that has been scrapped here. Despite these losses, this is a fantastic game of golf and actually one of the best titles currently on the Play. The new controls take this game to another level and mean that Tiger Woods PGA Tour 12 will steal many happy hours from your life.